Ever wanted to see the view from the top of Big Red, the largest sand dune in the Simpson Desert? Join expert tour guides Graham and Deb on this fully-accommodated 7-night driving tour around the Queensland, New South Wales and South Australian outback. The driving is not extreme and groups are small with tours limited to 5 cars. You’ll learn about the history of this fascinating region and the river systems. Stay in motels every night with all meals included and relax as Graham & Deb take care of everything you need. Travel West is a boutique travel company specialising in small to medium group tours that showcase the best the Australian outback has to offer - with great food and wine, hospitality and accommodation, these tours will cater to your every need. All tours are for non-smokers only and cover outback Queensland, New South Wales and South Australia. Travel West offers a range of tours to satisfy the needs of all types of travellers from escorted tours appealing to more mature travellers to tailor-made 4WD bush-camping adventures for the young and young at heart. 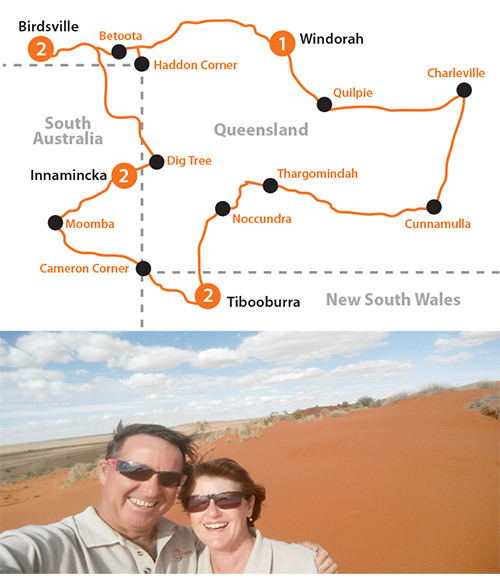 Travel West owners Graham and Deb Reid, from Charleville in Queensland, provide personal, high-end tours inspired by the beauty of outback landscapes, gourmet food and wine and professional establishments. People who ordered Birdsville, Innamincka & Corner Country – Motel-Accommodated 4WD Tag-Along Tour also ordered the free travel brochures below. Click on the images to find out more about these brochures.